Two goals by midfielder Blair Alston, the second a cracking volley, put Falkirk two goals up before Andy Ryan's angled strike set up a tense finish. "The players were brilliant. It was a wonderful effort," said Pressley. "I said to them not to leave anything within the dressing room and to a man they can hardly move their legs." And the Bairns boss added: "I thought it was a wonderful game. Great credit to Hamilton because at times they put us under enormous pressure but I thought we stood strong and we worked to a game plan. "We tried to bring them on to us a bit more and utilise our speed on the counter-attack and I thought it worked to good effect. "I thought we showed great resilience over the last 10 minutes." Accies boss Billy Reid was dejected that the match did not go to a replay against their First Division rivals, but he too was satisfied at how his players had performed. "I asked my players to give me everything and they did that," Reid told BBC Radio Scotland. "I feel for them. They deserved another chance. "It was a really good cup tie but when you are on the end of a defeat it doesn't feel like that. "For us to put so much into the game in both halves and come away with nothing, I thought it was harsh on my players. "In the first half we started really well and looked lively. I thought going in 1-0 down at half-time was unjust. "I said to the players just keep doing the same things, keep battering the door down. Against the run of play, the boy has scored a 25-yarder into the top corner and you're thinking it's not going to be your day. "But still my players showed the commitment and came forward." 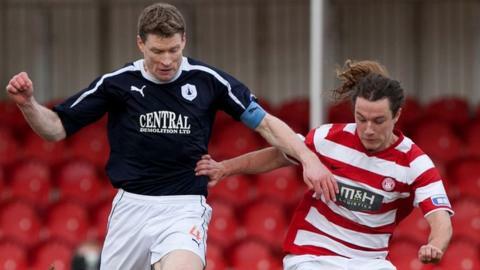 Accies' goalscorer Ryan had a gilt-edged late chance to take the match to a replay at Falkirk but he knocked the ball over the bar from three yards. Falkirk hung on and the club can now look forward to a return to Hampden, having visited the national stadium last season to take on Celtic in the Scottish Communities League Cup. Pressley said: "I am delighted for all our supporters. We brought nearly 2,000 here. They have remained fully behind this team over the past two years. "They obviously follow the team looking for days like they are going to get at Hampden so I am really pleased for everybody. "[The money from a semi-final] is a massive incentive for both clubs but for our supporters and players it is more than that. "It's the chance to go to Hampden and it's a great opportunity for the young players to enhance their reputation. "Of course the money aspect is vital, in terms of retaining things like the academy and our infrastructure, but most important was getting this club to a semi-final. "That's our second semi-final of a major competition in two years and the players should be exceptionally proud of that."